Size: * 5 lb. 12 lb. 25 lb. Our cold water formula contains wild caught salmon and herring. 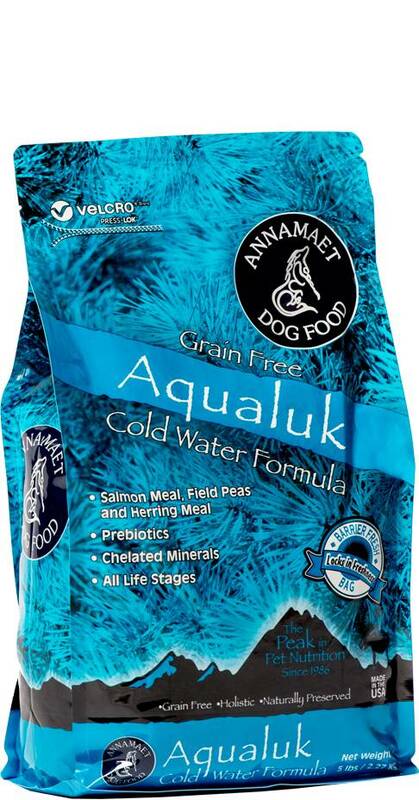 Annamaet Aqualuk is a rich source of Omega 3 Fatty Acids and has helped many dogs with ear, skin and coat issues as well as chronic digestive upsets. "Aqualuk" was respectfully given its name after spending many hours developing the food in Alaska; it means "fish" in the Unupiat Eskimo language. Aqualuk is formulated to meet the nutritional levels established by the AAFCO dog food nutrient profiles for "ALL LIFE STAGES" (Gestation, Lactation, Growth and Maintenance). Salmon Meal, Field Peas, Herring Meal, Chickpeas, Potato, Tapioca, Menhaden Oil (Preserved with Mixed Tocopherols (Vitamin E)), Canola Oil, Carrots, Celery, Parsley, Lettuce, Watercress, Spinach, Natural Flavor, Fat Product (Algae, Source of Fatty Acids), Lecithin, Calcium Carbonate, Salt, DL Methionine, L-Lysine, Cranberries, Lactobacillus Acidophilus Fermentation Product Dehydrated, Oligofructose, Yucca Schidigera Extract, Kelp Meal, Vitamin E Supplement, L-Ascorbyl-2-Polyphosphate (source of Vitamin C), Niacin Supplement, Biotin, Thiamine Mononitrate, L-Carnitine, d-Calcium Pantothenate, Riboflavin Supplement, Pyridoxine Hydrochloride, Vitamin A Acetate, Vitamin B12 Supplement, Vitamin D3 Supplement, Folic Acid, Choline Chloride, Potassium Chloride, Zinc Proteinate, Betaine Anhydrous, Iron Proteinate, Selenium Yeast, Copper Proteinate, Manganese Proteinate, Calcium Iodate.